This exhibition will feature a number of artists from across the country that each combine printmaking and performance in their art practice. 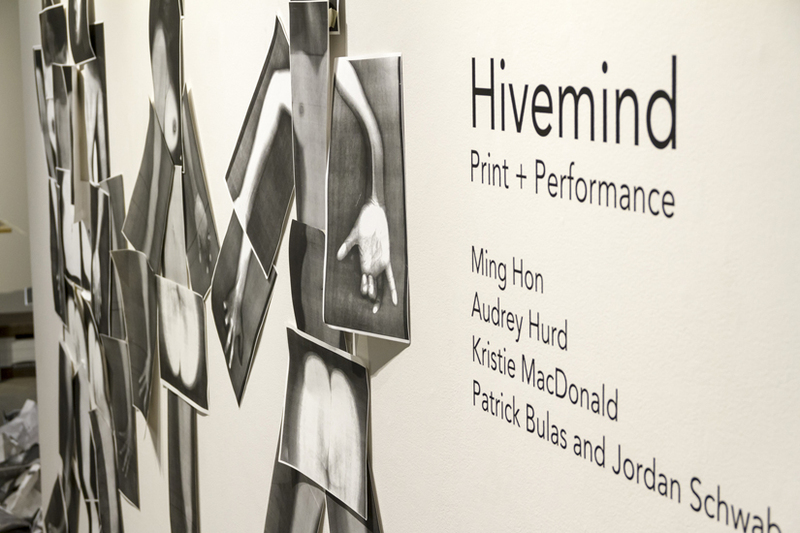 Even though each artist approaches this combination in a very different way, they all come together through a collective consciousness ‘the hivemind’, which is identified by a similar inclination to perform ‘the print’. Printmaking in the twenty-first century runs in parallel with and has been informed by the proliferation of digital visual media published by individuals within increasingly commodified visual landscapes. New technologies (from GIMP image editing to AutoCAD) have presented new ways of constructing images and of producing them, whether it’s by laser or 3D printer. Far from corroding the practice of printmaking, they have arguably galvanized it as one of the primary means of producing visual communication. Further, the value attributed by artists, publics, and the market has not been diminished by the increase in reproducibility. However, the labour involved in analogue printmaking is specific, requiring knowledge that is acquired over time and a physicality that contains a specific repertoire. As such, process, so heavily emphasized within printmaking, remains its primary distinguishing feature - it requires physical labour and that this physicality remain unseen, separate from the images that it facilitates the production of. So what happens to the print when this physicality is laid bare, when it becomes performance as well as process? 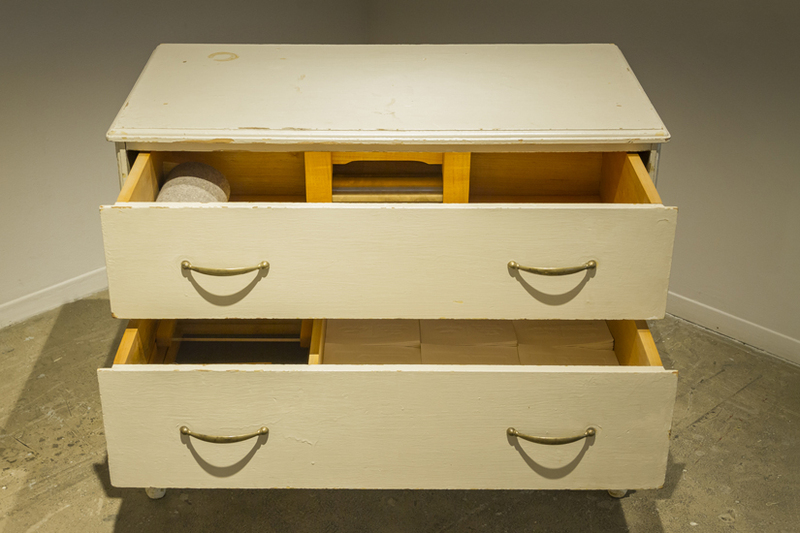 This exhibition offers different perspectives on this question, from an evidential reveal to Jackass style irreverence. 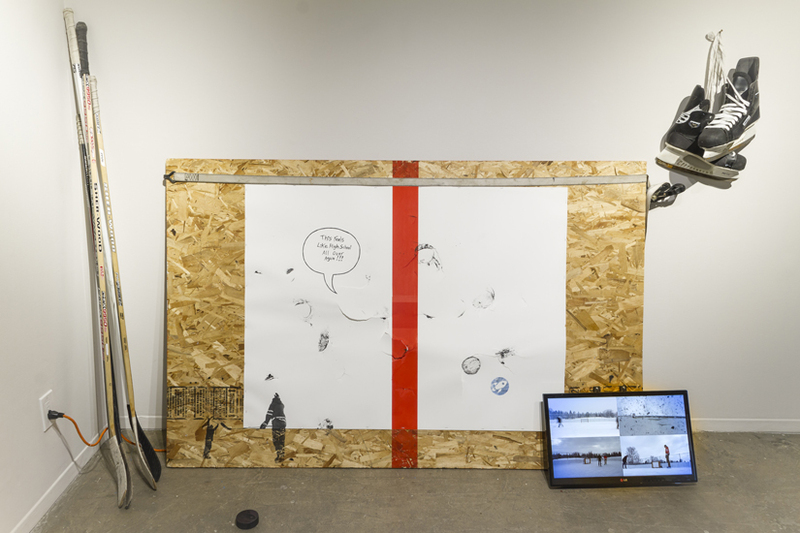 Jordan Schwab and Patrick Bulas’ puck prints employ recreational physicality that is deeply cultural, that of ice hockey, to generate the force required to make a print. The marks left by legible and illegible inked slapshots seem secondary to their novel, imperfectionist printmaking technique; the knowledge of the performance-process is integral to the prints’ value and apprehension, and their exhibition in a print studio’s gallery underlies the irony of their approach. Still Heading North by Kristie MacDonald, in contrast, is activated not necessarily by the printer’s body, but by another’s, yours perhaps. The piece does not claim to be performative: the line between participation and activation seems clear here. The absence of the artist’s body in the production of an artwork reads more as a question regarding the relationship between the performance of process and value, and of the manufacture of nostalgia and absence. Video is a natural recourse to document a process but in contrast to Schwab and Bulas’ documentary style that contributes to the overall performativity, Audrey Hurd’s stationary camera is more of a witness. If there were no video, the prints themselves would be the evidence of the action, and so would be conventional; but the video records and reveals her body and the heavy ball of modeling clay she is lifting and rolling. Every print involves gesture informed by force and weight but Hurd wants to show her unusual method. 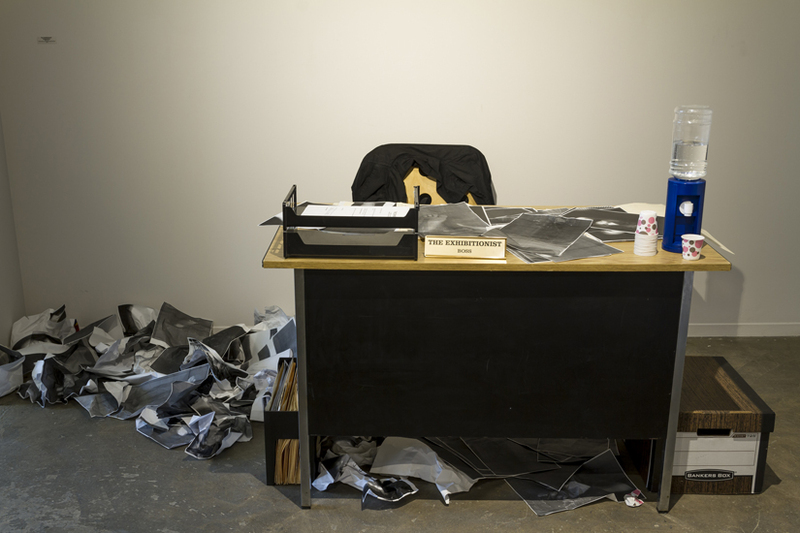 As such, she complicates the relationship between process-performance within the physicality of printmaking. 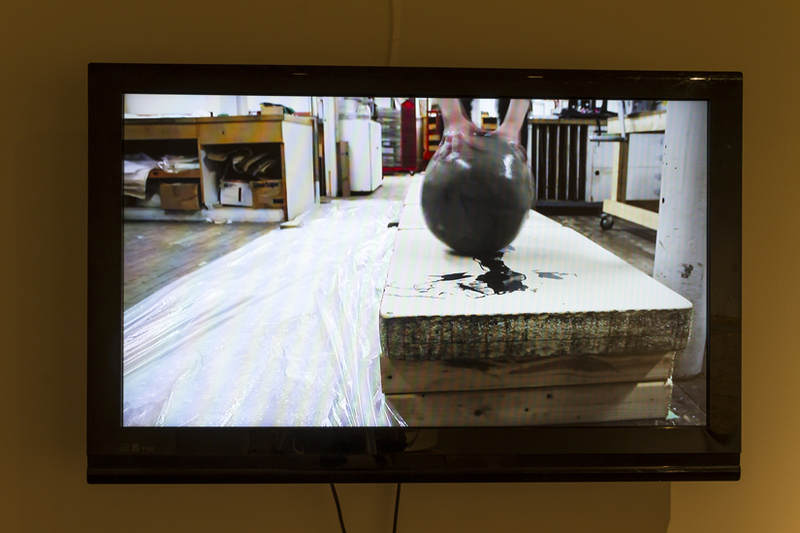 In contrast to the probing of traditional methodologies, The Exhibitionist-Resignation hyperbolises print creation, and in the context of Martha Street Studio’s gallery, their reproduction. 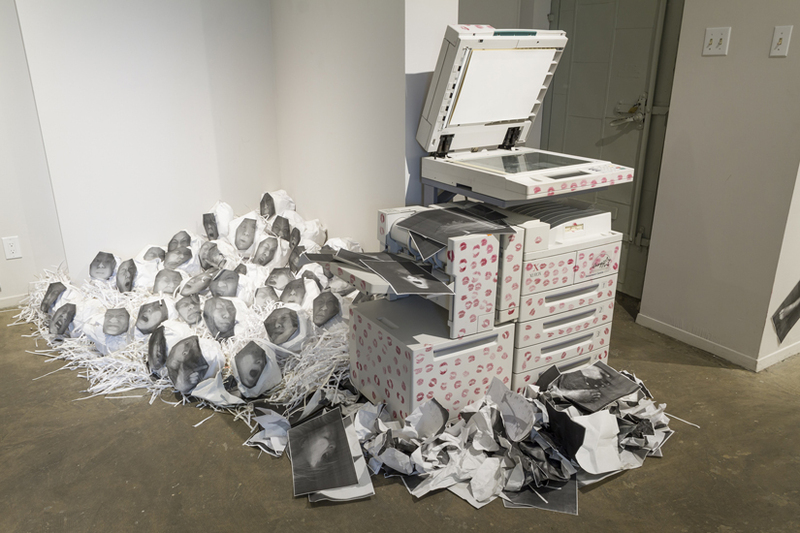 The photocopier in previous incarnations of The Exhibitionist has been a foil to the character (a powerful, demanding, and at moments slightly beserk, executive) embodied by Ming Hon, providing her the means to produce that which she despotically requires - representations of herself. The prints’ value hinges on the context of their production, of being ephemera of Hon’s performance, evidence of her body’s gestures, imprints, and effect on photocopied ink and paper. She is not critiquing printmaking, she revels in the twenty-first century’s endorsement of image-making as transitory, throw-away, personally aggrandizing, and available to all. And yet. What would happen if Hon were to make a limited edition of those photocopies? 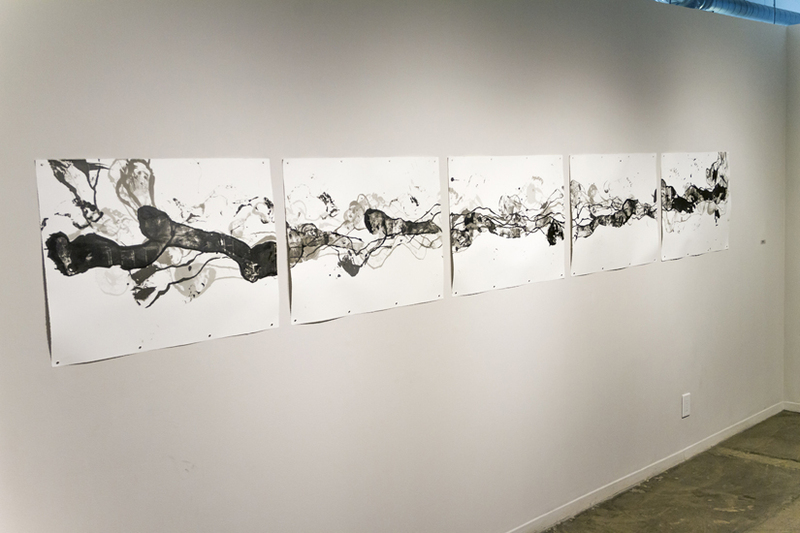 Just as the printmakers in this group exhibition have (mostly) made physicality and its performance central to their works’ meaning while being committed to traditional means of producing an image, Hon emphasizes the value brought by the specific body that produced those marks. hannah_g is a writer, contemporary storyteller, inter-disciplinary artist, mixtape DJ, community radio producer, and designer. She is also the Director of the Artist-Run Centre, aceartinc. and the editor of the gallery’s critical writing publication, PaperWait. Ming Hon's works have been exhibited and performed locally and internationally, including at The Taipei Artist's Village, as part of the National Art Gallery's Prairie Scene events in Ottawa, Surrey Art Gallery, Art Gallery of Mississauga, Latitude 53, aceartinc., Winnipeg’s Contemporary Dancers, Plug In Institute for Contemporary Art and more. She has collaborated alongside visual artists such as Sarah Anne Johnson, Rebecca Belmore, and Noam Gonick. As a dancer she has studied with Tedd Robinson, Peter Boneham, Susie Burpee, and is a graduate of The School of Contemporary Dancers in Winnipeg. Audrey Hurd grew up in Perth, Ontario, and is currently based in St John’s NL. She holds a BFA from NSCAD University in Halifax, NS and has participated in residencies and exhibitions across Canada and the US. In 2013, Audrey received the Emerging Artist Award from VANL-CARFAC Excellence in Visual Arts Awards. Kristie MacDonald is a visual artist who lives and works in Toronto, Canada. She has recently exhibited her work at BABEL Visningsrom for Kunst (Trondheim, Norway), Reed Collage (Portland OR), The International Print Center (New York NY), Gallery 44 (Toronto ON). She holds an MI from the University of Toronto specializing in Archival Studies (2011), and an MFA from York University (2016). She has been an artist in residence at Lademoen Kunstnerverksteder (Trondheim, Norway) and the University of Windsor (Windsor ON). Jordan Schwab, originally from Prince George, BC, holds a BFA from Thompson Rivers University (2005), and received his MFA from the University of Saskatchewan (2009). Through a previous career in commercial and industrial construction, he developed an interest in constructed environments, entropy and collective work to form the basis for his artistic practice. He has exhibited across the country, having been included in shows at SKOL gallery in Montreal, SNAP Gallery in Edmonton, Kamloops Art Gallery and AKA Artist Run and PAVED arts in Saskatoon. Patrick Bulas is an artist who has lived in Saskatoon for the past twelve years. Born in Edmonton, he has received both his BFA and MFA from the University of Alberta. He has had solo exhibitions in Edmonton and Saskatoon and has participated in group exhibitions in Finland, Vancouver, and Spain. In addition to his studio practice, he is the printmaking studio technician and a sessional instructor at the University of Saskatchewan and a founding member of Ink Slab Printmakers.